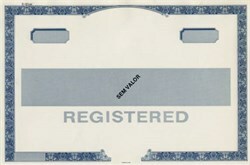 Beautifully engraved Specimen certificate from the Thomas De La Rue Specimen Certificate stamped Sem Valor. Sem Valor means "Without Value" in Spanish. This historic document was printed by Thomas De La Rue and Company around 1990. We only have one of each of the following colors: Blue, Colbalt, AquaMarine, Gold, Lavender, Orange, Brick, Rose, Brown, and Green.